Historically, the approval ratings of the President have been one of the best indicators of how their party will fare in the elections. This story helps capture the approval ratings of the current US president, Donald Trump, on a daily basis. 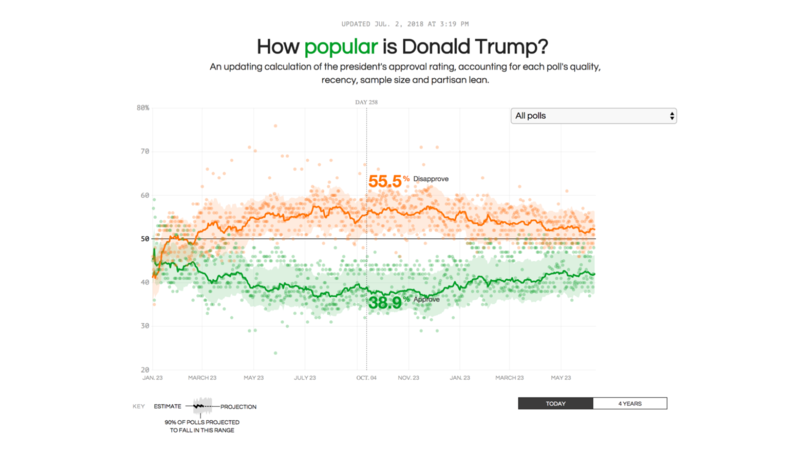 It shows how over the last 500 days in office, disapproval ratings of Donald Trump have been higher than his approval ratings on most days. The entire understanding of how this happens can be found on this page of project fivethirtyeight. Want to use this Data Story in your projects? We can plug in your data into our data story templates, or customize the template for your needs, or even build a completely new one. We would love to talk to you! How soon are you looking to get the final Data Story? We’d really like to get it to you as soon as possible! What changes are you looking to make to this Data Story? How exactly can we make this an awesome data story just for you? Where do you intend to use this Data Story? We want to know what the weather there is like. We’d really like to know about you.